I’ve lived my life in the midst of a natural wonder and never knew it ’til now. Here is a bird’s-eye view of my new discovery, The Fourche Creek Watershed. (Fourche is pronounced fush, rhyming with bush.) Thanks to Audubon Arkansas for this map and the factual information about it. The annotations are mine. Click on it to enlarge it. 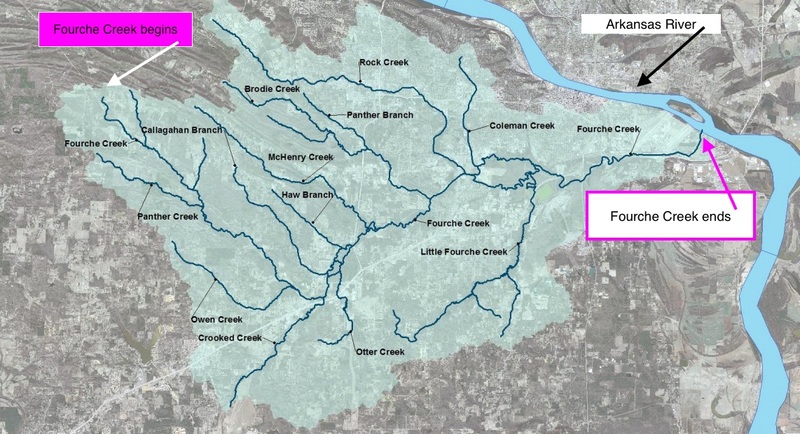 This map shows Fourche Creek and its tributaries, starting in Saline County, flowing east through Little Rock, and emptying into the Arkansas River. This watershed covers 108,800 acres! About 73% of the surface area of Little Rock drains into it! During a typical storm it can store up to one billion gallons of water! The creek, watershed, and wetland areas provide water purification, efficient storage of floodwaters, urban noise reduction, air and water pollution control, and wildlife habitat within the city. Fourche Creek itself is home to over 50 species of fish (one fourth of all Arkansas fish species). 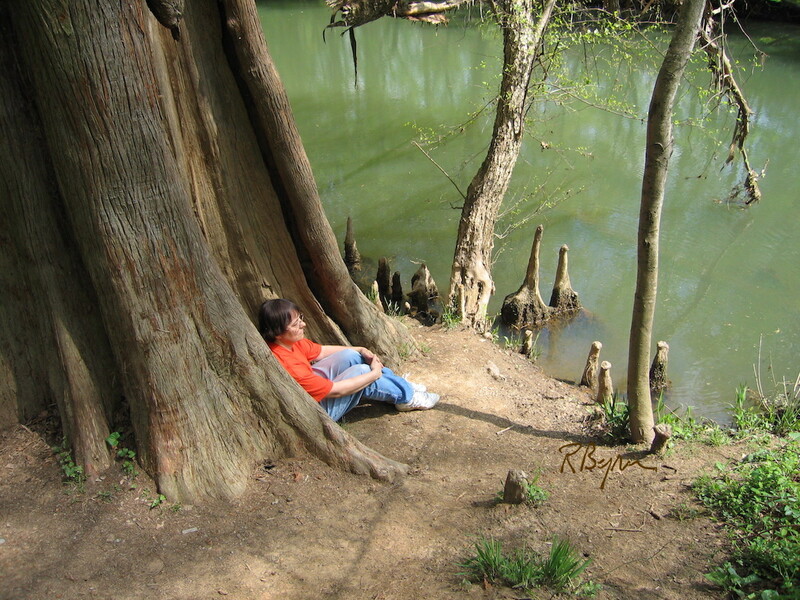 Also living there are three hundred year old bald cypress trees, other riparian trees, and a diverse population of permanent and migratory birds. The tributaries include six third-order streams and nine primary tributaries. If you don’t already know about stream classifications and are interested you can look here. I’ve been personally acquainted with some of these tributaries off and on all my life, and was surprised to learn about them: that they are tributaries, and how far they travel, and that they have been officially observed and classified. I’ve heard the name Fourche Creek since I can remember, but it was a vague reference to a creek somewhere around here that nobody I knew was concerned with. If ever as a child I saw a sign designating Fourche Creek, I don’t know it. The term watershed I first heard at age maybe twenty, thirty. My elders had no call to use that word when I was a child, and the subject wasn’t in the curriculum in my early schooldays, nor did it appear in my higher education. 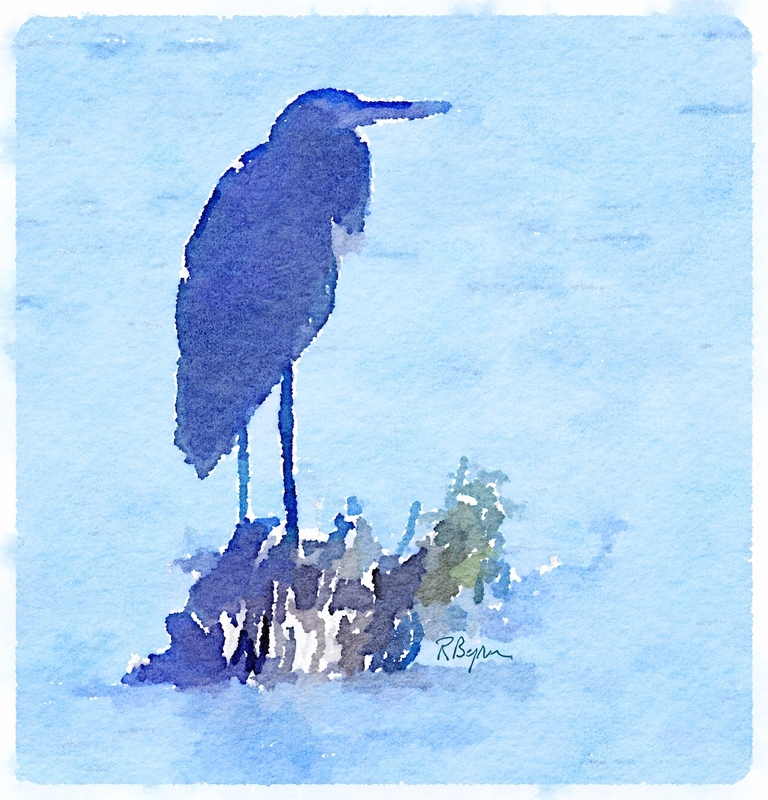 It was Audubon Arkansas that led me to the meaning–and the wonderment–of this watershed (and thus all watersheds). And here in my old age I became curious about exactly where within my native land Fourche Creek is, and what it is. 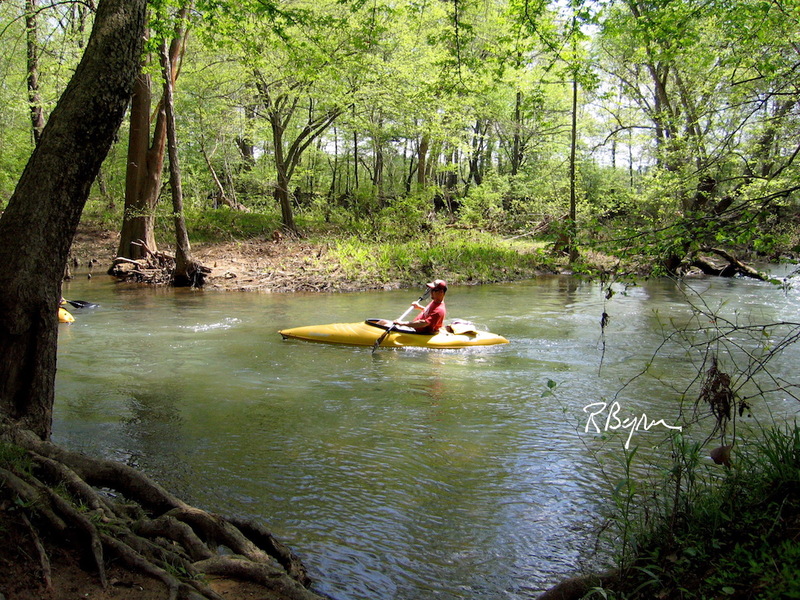 Within Little Rock’s city limits you can take a wildlife hike or float down Fourche Creek anytime you feel like getting away for half a day. How ’bout that for an Enchanted afternoon? Unfortunately, not all of Fourche Creek is this pristine-looking. Thoughtless and/or ignorant citizens of Enchanted Habitat have dumped and littered Fourche Creek without mercy throughout the history of the city. Audubon Arkansas publicizes this pollution, and has lead a volunteer cleanup campaign for the last ten years. The volunteers have removed tons of dumped tires, bottles, and general trash, and will keep going. Unsung heroes. If you want to know about the different kinds of volunteer opportunities sponsored by Audubon Arkansas, you can start here. Also Audubon Arkansas wants us all to know that anything that flows down a storm drain goes untreated into the nearest waterway. Their efforts toward discouraging dumping in storm drains includes a drain sticker program and an artists’ competitive drain-painting campaign to attract attention to the problem: Drain Smart. I came back from my fact-finding forays about the Fourche Creek Watershed with a sense of thankfulness and a beginner’s appreciation for this great resource hidden in plain sight. I hope our national elected officers will reverse the present trend of devaluing the environment and will instead increase funding to help our local people rescue and preserve it. What example of worth could be plainer than the Fourche Creek Watershed? In a recent post I related my friend’s contest with a Carolina wren who was determined to homestead in her house or at least near a door. We left the tale at the stage called “it’s a draw”, with the bird nesting in a hanging flower basket on the covered back porch. 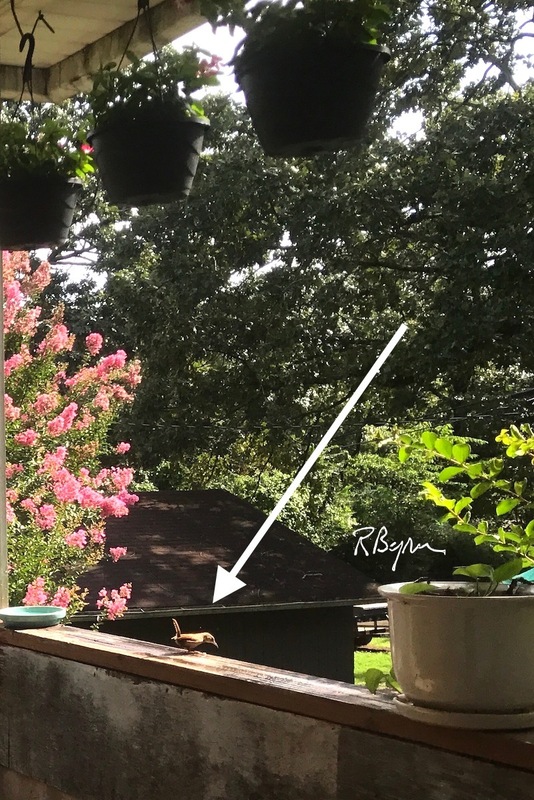 Chapter Two begins with my friend’s realization that new babies are in that flowered nest, and that she herself must give up her own lovely mini-vacations on the porch, on the chaise, in the shade, drinking tea. I interviewed her about this experience. She went on to say, though, that she finds giving up her comforts to be a fair trade-off. I asked what she is getting in return for her temporary loss. She said, “Every time I go in and out my back door I get a little gift. The babies (there are either two or three) don’t know to shut up when I’m out there. I hear their little voices get stronger and louder every day. I can go on down to the yard and sit (in the hot sun) and watch the crafty parents feed the babies. “They approach one at a time. They rarely fly directly to the nest. 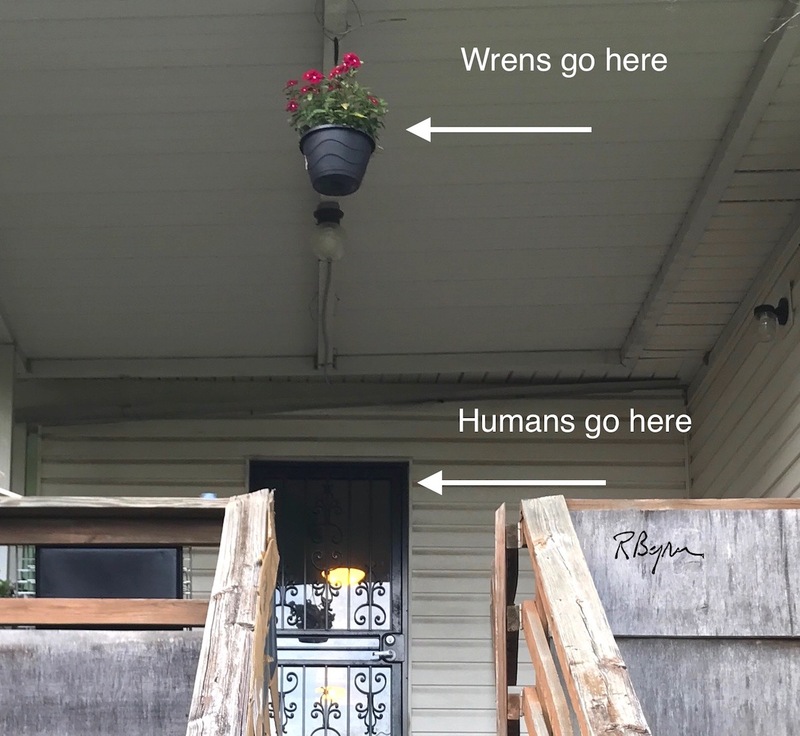 They light under the porch. Then hop to the railing on the steps. Then the top rail. They take a good look around and then hop up to the nest in the hanging pot. The pot swings, the luckiest baby gets a bug, things are quiet for a few seconds, then the parent perches at the edge of the pot and takes another look around before hopping off and swooping away. During this process, the second parent has usually taken up a waiting position, then takes its turn when the other is finished. “Why is this so magical? It’s a process that is going on everywhere and is not unusual. But these little birds—I’m getting to know them so well. They are so keen and clever. 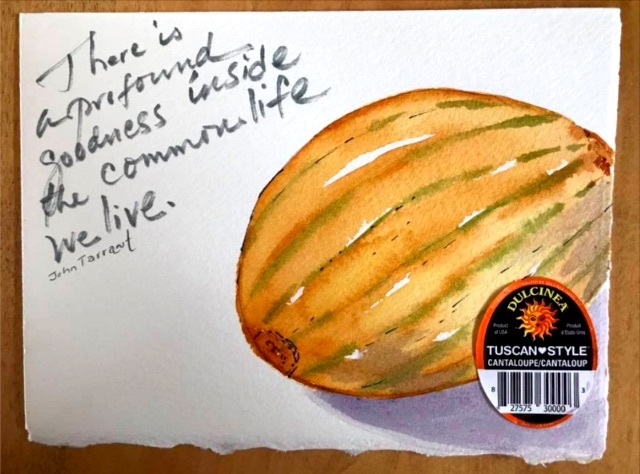 Applause to Patricia Ryan Madson, my friend from the Etegami Fun Club, for this beautiful melon card and message. Posted with her permission.